Some children seem to just be born with a love for reading and will bring books with them wherever they go. Other children are the complete opposite and would rather do just about anything other than read. A love of reading will benefit your child in countless ways. 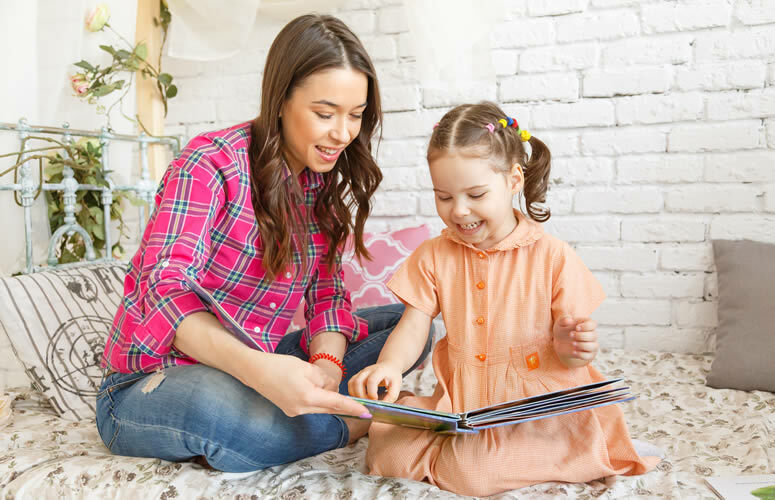 From empathy to awareness, to knowledge and increased comprehension, your child will develop important skills if he or she learns to love to read early on. And it’s important to note that children who love reading have been shown to do better in school and on standardized tests. Don’t worry. If your child doesn’t naturally run to books from the get-go, but you can still nurture a love of reading with these six helpful tips. Children will enjoy books a lot more if they are allowed to choose the books themselves. While you may wish your child would just put down the knock-knock joke book and pick up something of substance, let your child choose what books her or she wants to read. Most likely, the joke book phase will run its course, and your child will then move onto something else. You can guide him or her to more sophisticated choices (How about a fact book or The Boxcar Children? ), but back off if your child resists the idea initially. Let your child enjoy what he or she has chosen. Set up a cozy nook in the corner of your living room. Buy a bean bag chair for your child’s bedroom. Lay out a blanket underneath a shady tree on a hot summer day. Find a library with inviting couches and well-lit aisles that invite exploring of the bookshelves. Make reading time comfortable and cozy so your child looks forward to spending time with a book. If your child isn’t one for being alone, announce it is family reading time, and everyone must gather to the living room with the book of their choice for 20 minutes of reading. Allow snacks. Read to your children if they can’t, or don’t want to, read to themselves. If you have a reluctant reader, a book jacket alone isn’t going to be enough to convince your child to crack the spine. Grab a few popular children’s books for yourself to read, and see what you think. If you love them, you can describe a few dramatic plot points, character traits you love, or emotions you felt while you were reading the book. Speak genuinely, and only recommend books you really did enjoy. If your child doesn’t take the bait after your passionate admiration, leave the book somewhere your child will be sure to see. Chances are, your child will pick it up eventually. Think back to the preschool programs of your child’s youth. Remember how the children sat on the rug, enthralled by the picture books the teacher read to the group? There’s no reason you can’t continue that tradition. Even older children still like picture books (although, they may not admit it), and if you pull one out, they’ll find themselves mesmerized in spite of themselves. You can also do this with chapter books. How about gathering the family together each night for one chapter? Don’t be surprised if your children beg for more. It will be hard for your child to pick up a book if there are no books in your home. That’s why good preschool programs include books in the classroom. During downtime, preschool children are often drawn to toys. However, they also could find themselves with a book in hand simply because the books were left in an accessible place. Set a reasonable amount of time that your child must read each day. 20 minutes is typically a good place to start. Again, don’t criticize your child’s book choices during this time. You can even let older children read comic books and picture books. The point is that your children will come to understand that reading is a daily ritual. Some children will be done after 20 minutes, but many will beg to keep going! Falling in love with reading is a process for some, and that’s more than okay. Be patient and creative, and your child will thank you later.